According to a World Bank report in 2011, the number of skilled Malaysians living abroad rose 300 per cent in the last two decades, with two out of every 10 Malaysians with tertiary education opting to leave for either Organisation for Economic Co-operation and Development (OECD) countries or Singapore. The New Economic Policy (NEP) and other programmes in its vein have been blamed for driving the country’s non-Malays to find an exit, with Singapore being the destination of choice for geographic and cultural reasons. Opportunity and access to higher education to local public institutions of higher education is limited and scarce. The "7-2-1" system introduced under the New Economic Policy (NEP) in 1970 for almost 4 decades and exorbitant fees (but minus a wholesome campus life) in private institutions have not helped matters but in fact turned from bad to worse. What future do Malaysian students have in Malaysia if NEP continues to run its course indefinitely? I strongly believe that the rule of thumb in selecting students for tertiary education policy is "The academically talented and smart students should get priority to be nurtured by the government" but this is not happened in Malaysia. The selection of students for tertiary education should be purely based on merit and nothing else can override it. However, it seems there is no end to their plight. Their preferred choice of study are ignored all these years. These imbalance policies have greatly affected the quality of education at all levels. The misallocation of resources and unproductive policies will definitely put Malaysia in a disadvantage prepositions in the era of globalization and internationalization of education. The road ahead will be cloudy and bumpy for all of us if the policies allowed to continue indefinitely. 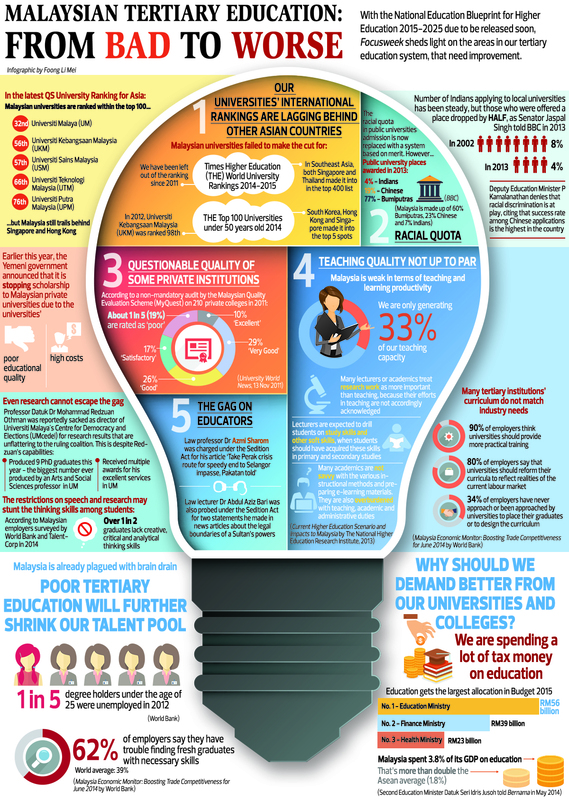 Below are the infographic compiled by Foong Li Mei from The Focusweek based on various reliable sources on the facts and figures about the state of Malaysia's education.